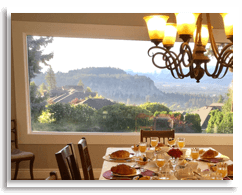 Breakfast: the perfect start to any day! 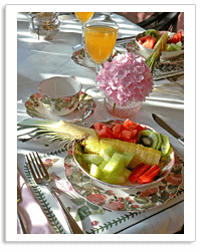 Breakfast is a full 3 course menu with fresh baked goods, local seasonal fruit, and entrée. 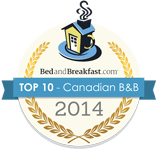 A few of our best successes include: homemade granola and yoghurt, eggs benedict and fresh asparagus, eggs Pacific (smoked salmon and poached eggs with a lemon dill sauce), orange and thyme pancakes, waffles with sautéed blueberries, baked peach French toast, or morning casserole with ham and Welsh, Irish or Canadian aged cheddar. Kelly is always experimenting with new menu items, so although you may be a “test subject” in this process, you can rest assured that so far his success rate is 100%! 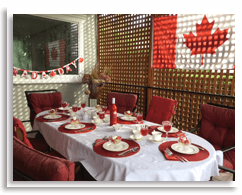 We always make an effort to showcase local foods and fresh seasonal fruits, and to emphasize creative presentation and we are happy to cater on request at the time of booking to vegetarian, vegan, gluten-free and lactose-intolerant guests. Breakfast is normally served from 7:30 – 9:30 am, however, if you need to leave us early, we can easily provide you with a take-away if you let us know in advance. Morning Coffee is served from 7:00 am in the living room. 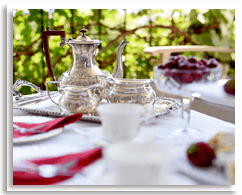 Welcoming afternoon High Tea – Served daily upon arrival. 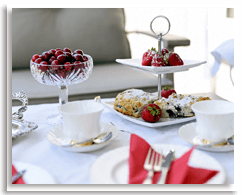 In keeping with our name and brand, we serve afternoon high tea with fresh baked scones, local seasonal fruit, and chocolate dipped strawberries (that’s the “English” touch) on arrival. 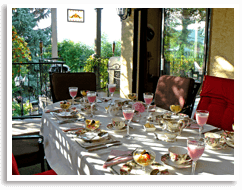 Afternoon tea is served on the patio overlooking the views of the Okanagan Valley, our English gardens and private outdoor pool.